While we gawk over the intense trailer of Tumbbad that was dropped yesterday, there are rave reviews for the film from the largest genre specific film festival in the US, Fantastic Fest. 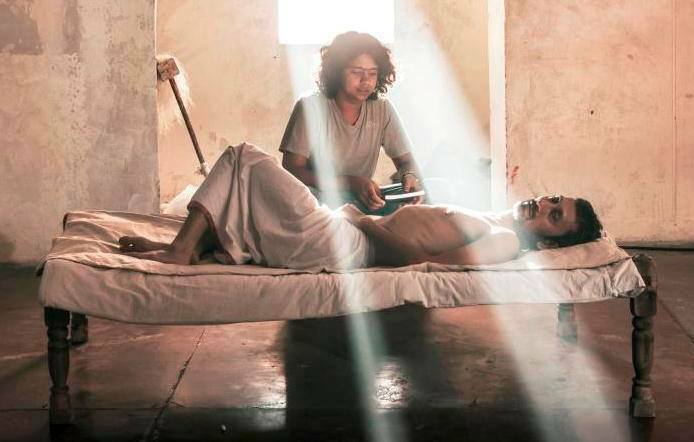 Tumbbad bridges gaps between different worlds – India and any viewer’s homeland – through a common language: storytelling. Costumes and cityscapes may be unfamiliar, but Hastar’s terrifying chase sequences require no translation when it comes to horror appreciation. Mad creature-feature designs, Academy-worthy blends of color and pristine optical packaging, despicable character work meant to provoke heartlessness traded for materialistic grandiosity – Tumbbad is a full genre package seasoned with a pungent foreign kick. A welcoming breed of horror that transcends barrier, creeds, and beliefs. Never really a scary film, Tumbbad is more focused on the horror of human behavior than it is on creaking doors and the terror of what lurks in the dark. It’s rare that something comes together as well as the trifecta of score, direction and scope does, but Tumbbad manages to create something really special, while making sure to keep things nice and horrifying along the way. Apart from producer and actor Sohum Shah, the film also stars Jyoti Malshe, Dhundhiraj Prabhakar Jogalekar, Anita Date and Deepak Damle, and is releasing in India on October 12th. We have written in the past about the excitement around our home-grown mythological thriller Tumbbad at Venice Film Festival. The trailer for the film was released today. Take a look. The trailer showcases the mood, the mystery, and the special effects that are woven into this story of a goddess who created the entire universe, and the horrors around it. As we write this, the trailer has generated a lot of interest and excitement amongst fans and viewers. Aanand L. Rai, Sohum Shah, and Anand Gandhi’s much awaited mythological thriller about a goddess who created the entire universe, Tumbbad opened the Venice Film Festival’s Critics’ Week and is generating a lot of buzz at Venice Film Festival. So here’s all the buzz around the film at the fest. HumaraMovie’s short-film anthology Shuruaat Ka Interval is now playing in select cinemas in Mumbai, Delhi, Pune, Bangalore and Ahmedabad (see showtimes above). What’s more- there is also an Audience Choice Award for the favorite film of the viewers. PVR Director’s Rare & HumaraMovie are presenting the short film festival/anthology Shuruaat Ka Interval, which includes 8 shorts from various filmmakers, chosen and mentored by filmmakers Imtiaz Ali, Vikramaditya Motwane, Anand Gandhi & Vikas Bahl. Shortlisted candidates had access to script consultants- Bijesh Jayarajan (Yudh), Ritesh Shah (Kahaani, D Day, City Lights), Rajashree ‘urf’ Raju and Kshiti Nijhawan Agrawal. They also had access to Mukesh Chhabra and his team for casting. 1. August by Shishir Jha: Good and Evil, Yin and Yang… The continuous dichotomy of life. The path is not always a choice. A subtle interpretation of this paradox. Does the butcher only kill? 2. The Last Audition by Krishan Hooda: Anand Kumar is a struggling actor consumed by the struggle. The attempt to land a role, and the effects of the audition take over his life. He live, breathes, sleeps this process. In this obsessed role, does Anand land himself the ticket to stardom? Or does this obsession lead to his ruin? A dark tale of one’s life when you cannot differentiate life and camera! 3. No Exit by Ankit Tripathi: Is life a burden? Is memory the only thing which binds us together? Is that the reason for our misery? Cycle of life and death- is there an exit option? 4. Ayan by Amrit Raj Gupta: In the best traditions of farce- what happens when your main character disappears during the interval of a play. Do you rework the play? Can you rework the play? How do the other characters react? A laugh fest when the characters of Ramayan become real backstage. 5. Interval 3D by Palash Vaswani: What happens when a character from a Ramsay Brothers-style B Grade horror flick meets the audience? Shock, awe, funny- a ridiculous scenario from which you can only laugh your way out! 7. Final Interval by Aarti Bagdi: This is the story of a housewife, a mother, a mother-in-law, a grandmother, a superwoman. She binds the extended family together. And she needs a break! 8. Gatekeeper by Atanu Mukherjee: Gatekeeper revolves around the life of a man who guards a railway crossing. His only source of excitement in life is watching the trains passing by. Is there something which intrudes in this monotony? Or can this monotony be enjoyable? Shuruaat Ka Interval releases in select cinemas in Mumbai, Delhi, Bangalore and Pune on 15 August, 2014. It’s a great time for desi documentaries. In the recent past we have seen some pretty terrific ones- Malegaon Ka Superman, The World Before Her and Katiyabaaz to name just a few. Which is why it’s a pity that Nishtha Jain’s powerful documentary Gulabi Gang hasn’t quite got the audience it deserves- yet. Perhaps the makers ought to have employed the Gulabi Gang themselves to whack our lazy, torrent-savvy audiences into theaters. 😉 The film is now running in its second week in a select few theaters/cities with ticket rates further slashed. There’s no good excuse to miss this one, really. Gulabi Gang by Nishtha Jain is undoubtedly a rigorous study of a women’s movement in the deep interiors of Bundelkhand where a group of women networked between several villages have formed a ‘gang’ to fight against the oppression of women and dalits. They drape themselves in Pink sarees and carry pink lathis that becomes an image of the identity that binds these women. There are complex issues that these women are dealing with and fighting. Young brides are being burnt, dalit activists murdered and certain high-caste Choudharies have concentrated all power in their hands suppressing any and every dissent using gun and muscle power. It is this nexus of power and oppression that the Gulabi Gang is trying to tear apart under their feisty leader Sampat Pal. Sampat Pal inevitably becomes the ‘hero’ of this film, her infectious zest and fearlessness naturally grabs the attention and it’s hard not to root for her like we would for the angry underdog taking on the system in a Bollywood film. It only helps that Jain adopts a form of narrative that is simple in structure but quite inventive. It follows 2-3 cases that Gulabi Gang encounters and as it does so, quite curiously these cases turn to a kind of whodunit with the Gang acting as detectives trying to uncover the truth behind the violence inflicted on women. Like in one of the cases, a young wife is found burnt inside the house. When Sampat reaches the spot, the in laws of the woman claim that she got burnt while making rotis but Sampat in true detective spirit, deduces that it cannot be a mere mishap. There wasn’t any stove at the spot, nor was any other part of the house burnt or even charred. Sitting in the audience even we also could start the process of knitting the clues together and deducing while also being acutely aware of entire machinery which includes the panchayat and the police trying to push this crime under the carpet. Sampat Pal’s own relative burns his wife but she wants the truth to come out. When the director’s voice asks her will you fight against your kin as well, she replies inspiringly ‘I just want to find out the truth’. Quite fittingly then, Anand Gandhi (director, Ship of Theseus) called this film a ‘reinvention of detective genre’. This is a welcome change as the problem with most documentary films dealing with social evils, people’s movements, subaltern issues etc. is that they have sort of reached a saturation of form. While they do deal with a variety of issues, they follow the same old form – interview of key players, a bit of commentary, a bit of field action all merged seamlessly to ‘illustrate’ and ‘explain’ and thereby ‘document’ the problem. Such a form has turned even more uninteresting with its derivatives populating news channels through their ‘human stories’. Thankfully the film doesn’t stop short of also pointing towards the limits of such genres that evidently end with a resolution a climax arrived at through carefully plotted series of events. Unlike in a detective genre film, we do not get to know whether the culprit was caught or not. Often the battles are lost and the guilty gets away. But like the truest of detective stories, the importance lies in questioning what one gets on face value rather than solving the puzzle and Gulabi Gang does point our attention towards the need to inquire and shakes up the static status quo. Instead of a gradual convergence towards a resolution of problem, the film starts to spread in and out of such inquiries of cases and looks at the varied other forms of struggle that a people’s movement engages in – organization, activism, mobilization, planning etc. One of the most charming and equally thought provoking sequences involves the meetings and the practice sessions of the Gulabi Gang. As a ritual Gulabi Gang practices lathi fights with a playful zest as two women take on each other while others on the periphery cheer and clap. It quite casually points towards a ritual- even a ritual of violence (though more for protection in this case) that is involved in any people’s movement. The entire movement also resembles a theatrical performance. There is backstage practice and rituals and there are costumes and props – the pink sarees and pink lathis juxtaposed against the dry, arid brown and gray landscape is an image that gives tremendous gravitas to the Gang and binds them into a community. In fact the saree and the lathi are the first things that are given to the women who join Gulabi Gang and they have to change into the ‘costume’ right away. There is a slightly comic cut in the film where we see Sampat Pal encouraging the mother of the burnt bride to fight her case and in the next shot the frail creature of the mother is draped in bright new pink saree as she is on her way to the court with the Gang. It’s a terrific reminder of how a bit of theatre and performance is a part of every movement or revolution. It also reminds us how such performativity can be appropriated for contradictory causes – for assertion of justice or for religious or political fanaticism. Gulabi Gang ends with tragic human drama as the documentary manages to trace a character arc of sorts of one of the Gang’s members – Husna. Husna, a hardworking and passionate activist and member of Gulabi Gang takes a position completely contradictory to the movement when her own brother kills her sister for marrying out of love. When she supports him instead of condemning in the name of culture and tradition, one is hit by the extent to which such fundamental, patriarchal ideas can deride compassion and human justice and what a difficult battle Gulabi Gang is fighting – not just externally but internally. For me, the film was special because it shows how certain genres – like detective, political, social drama, human drama genres – can seep into documentary also; in-fact they come from the reality that the documentary often deals with. But, it also shows how cinema can avoid using genre as a trope and move in an out of genres to question the complexity instead of using such genre games to manipulate sentiment and to take an easy position of a sympathizer. The last sequence shows Gulabi Gang members waiting for a train on the platform and few men looking at these women clad in Pink Sarees with contemptuous humor. For them they look nothing short of fancy dress. One of the men asks the man who moves around with the Gang – ‘kuch milta hai issse’. The director shows amazing empathy here as she cuts to the image of Sampat Pal staring into the camera or perhaps into the far horizon, sitting amidst other women with eyes filled with acceptance of difficulty but shining with a rare honest hope. All the contempt of the scene just washes away and we are filled not with sentiment but with emotion – an unsaid but urgently felt hope and a desire at least to think. What’s the fun if a film doesn’t get its share of contrarian views? And with all honesty, not for the sake of it. So over to Aditya Sudarshan who ponders over the latest indie film which is the toast of the town. By now, Ship of Theseus is a phenomenon. From UK critics to Bollywood directors, from Dibakar Bannerjee to Karan Johar, it has been hailed as an absolute, once-in-a-blue-moon work of genius. That these opinions are honest, that the film genuinely spoke to people, is not being questioned here. The question I am asking is: Why? How? And what does this say about us- sociologically? I say ‘sociologically’, because as art goes, I am going to argue that Ship of Theseus features a level of thought that can at best be termed ‘half-baked’, and a level of storytelling which is strictly average. And perhaps if either of these elements had been different- for better or worse- the flaws of the movie would have become indisputably clear. It’s easy to recognize that a film which has nothing to say and says it badly, is bad- take any example from mainstream Bollywood. It’s also easy to recognize ‘grand failures’- for example, Terrence Malik’s Tree of Life, grounded as it is in actually deep philosophy, shows up its failed story-telling. But deception arises when a movie has nothing particular to say and says it not too badly. In the case of SoT, this multiplication of mediocrity has passed as good- and then, wedded to the truly beautiful cinematography, has passed as genius. Why is the thought in SoT mediocre? Because name-dropping is not the same as knowledge. Because being enamoured of philosophy is not the same as doing philosophy. In the history of human thought, the Grecian paradoxes, like Theseus’, and Zeno’s (who asked how a man could cross a room, when he must first cross half the room and before that half of the half and so on infinitely), have actually been tackled. Understanding what infinity really implies is a part of the answer. Getting to grips with ‘God’ is a part of the answer. But I am getting ahead of myself. I am starting to engage seriously with questions that SoT does not even seriously raise. And the key word here is seriously. If SoT had seriously put forth a vision of a Godless universe where karmic causality is the only truth (as in the lines from the monk’s chant, Naham Janami), of a world without boundaries where we are really not individuals but colonies, where there is no intrinsic right or wrong but only consequences to actions- had the movie had this power, then it would have made sense to plunge into such discussions. The very fact that these discussions seem unwarranted and ‘too much’ here, is testimony to SoT’s half-heartedness. After all, enjoying a mantra is not the same as understanding its meaning. The mystery of free-will is not disposed off because a long-haired lawyer has read an anecdote about the behaviour of ants. Our moral sense of right and wrong is not shown to be illusory because an old woman with a broken leg has probably read ‘The Secret’. What such scenes and dialogues do, is flatter viewers into believing they have engaged with deep and significant truths, when really they have merely gawked at them- from a very, very safe distance. I have less to write about the story-telling, because as I said earlier, had it not been for their supposed philosophical weight, I doubt these stories would in any case have been so praised. Without doubt, the three stories in SoT all feature interesting, meaningful premises and strong performances. But the film fails to confront a single great crisis in any of them. All together, they are a bundle of beginnings. The story of the blind photographer reaches her crisis- and rests there. Why and how the monk’s faith alters, and what the alteration really means to him- is untold. And humour and stock cliches (the ‘fat sidekick’, the ‘hapless slum-dweller’) become means to escape engagement with the real moral realities of ‘do-gooding.’ When the grandmother says the line that closes the third story (prior to the epilogue)- ‘itna hi hota hai‘- she could well be talking about the whole movie. So you thought Ship of Theseus would really say something? Arre bhai- ‘itna hi hota hai‘. I hope it will be noted here that I’m not heaping any insults whatsoever on this film. I don’t say it’s pretentious. I don’t say it’s dishonest. It is, in my opinion, almost touchingly honest- the way an adolescent enamoured of big ideas- and unequal to them- is touchingly honest. Unconsummated ideas, unconsummated stories, there are all the honest expressions of an over-awed and wonder-struck mind. What is not ok, is for such an un-rigorous and adolescent piece of work (and ‘adolescent’ here, I emphasize, is not a pejorative, but a term of description), to pass as a mature masterpiece. This brings me to the question I started with and am also closing with, because I am going to think about it further myself. (And this is the only real food for thought SoT left me with). Why is this movie a phenomenon? Are we such suckers for beautiful cinematography? Surely not. Or are we so starved for any spiritual ideas in our lives whatsoever, that we can’t recognize cooked material from uncooked? I think perhaps this is close to the answer. Perhaps we have kept ourselves so desperately stranded from the big questions- the meaning of life, religion, morality, God- that even a child-made raft, passing by our desolation, can be hailed by us as our flag-ship.